The Hong Kong Police Force (HKPF; Chinese: 香港警務處) is the largest disciplined service under the Security Bureau of Hong Kong. It is the world's second, and Asia's first, police agency to operate with a modern policing system. 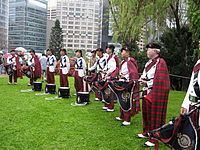 It was formed on 1 May 1844 by the British Hong Kong government with a strength of 32 officers. In 1969, Queen Elizabeth II granted the 'Royal' prefix and the HKPF became the Royal Hong Kong Police Force (RHKP), only to be removed in 1997 upon the transfer of sovereignty of Hong Kong to China. Due to the one country, two systems principle, the mainland authorities may not interfere with Hong Kong's local law enforcement affairs. Thus, HKPF is completely independent from the jurisdiction of Ministry of Public Security of the People's Republic of China. The Hong Kong Police has been serving Hong Kong since shortly after the island was established as a colony in 1841. On 30 April 1841,[not in citation given] 12 weeks after the British landed in Hong Kong, Captain Charles Elliot established a police force in the new colony. The first chief of police was Captain William Caine, who also served as the Chief Magistrate. The force was officially established on 1 May 1844. The 1950s saw the commencement of Hong Kong's 40-year rise to global prominence, during which time the Hong Kong Police tackled many issues that have challenged Hong Kong's stability. Between 1949 and 1989, Hong Kong experienced several huge waves of immigration from mainland China, most notably 1958–62. In the 1970s and 1980s, large numbers of Vietnamese boat people arrived in Hong Kong, posing challenges first for marine police, secondly for officers who manned the dozens of camps in the territory and lastly for those who had to repatriate them. The force was granted the Royal Charter in 1969 for its handling of the Hong Kong 1967 riots—renaming it: the Royal Hong Kong Police Force (Traditional Chinese: 皇家香港警務處). The recruitment of Europeans to the force ceased in 1994, and in 1995 the Royal Hong Kong Police took responsibility for patrolling the boundary with China. Prior to 1995, the British Army had operated the border patrol. The force played a prominent role in the process of handover of sovereignty in 1997 and performs ceremonial flag-raising each anniversary. In more recent history, the police force played a prominent role in handling the 2014 Hong Kong protests. Plate Royal Worcester Fine Bone China. 150th Anniversary of the Royal Hong Kong Police Force, 1844-1994. The current crest of the force was adopted in 1997 so as to retire symbols of British sovereignty. Changes to the crest included: St Edward's Crown replaced with a bauhinia flower; the official title of the force was changed from the monolingual 'Royal Hong Kong Police' to the bilingual '香港 Hong Kong Police 警察'; the badge image changed from one depicting a junk and British ship in Victoria Harbour, to one with a modern view of Hong Kong Island and the modern skyline (Queensway Government Offices, Bank of China Building, City Hall, HSBC Building, and Exchange Square). Changes to the flag included replacing the Blue Ensign, featuring the old crest, with a single blue flag with the crest centred in the middle. The Force is commanded by the Commissioner of Police, who is assisted by two deputy commissioners; a "Deputy Commissioner – Operations" supervises all operational matters including crime and a "Deputy Commissioner – Management" is responsible for the direction and co-ordination of force management including personnel, training, and management services. For day-to-day policing (Operations), the Force is organised into six regions:Hong Kong Island; Kowloon East; Kowloon West; New Territories North; New Territories South; and Marine Region. The Force Headquarters (Management) is made up of five departments: Operations & Support; Crime & Security; Personnel & Training; Management Services; Finance, Administration & Planning. Regions are largely autonomous in their day-to-day operation and management matters, and each has its own headquarters, which comprises administration and operation wings, Emergency Units, as well as traffic and criminal investigation units. Each region is divided into districts and divisions and, in a few cases, sub-divisions. Currently, there are 23 districts. The policing of Hong Kong Island, Kowloon and the main towns of the New Territories follows a similar pattern. Responsibility for law and order on the Mass Transit Railway, which runs through most police districts, lies with the Railway District. Railway District based at 2 Siu Yip Street in Kwun Tong is responsible for patrols on the MTR. Police Force operational matters are coordinated by the Operations & Support Department. Land Operations and Support are divided into six regions, whereas marine matters are managed by the marine police—organised as one Marine Region. Each land region comprises two wings, the operations wing and support wing, and a traffic headquarters (which is part of the operations wing). The department is charged with the formulation and implementation of policies, the monitoring of activities and the efficient deployment of personnel and resources. Operations Wing coordinates counter-terrorism, internal security, anti-illegal-immigration measures, bomb disposal commitments and contingency planning for natural disasters—they are also responsible for the Police Dog Unit. The Operations Wing consists of three sections: The Operations Bureau, the Police Tactical Unit, and the Explosive Ordnance Disposal Bureau. Operations Bureau comprises the Operations Division, the Counter-Terrorism and Internal Security Division, and the Key Points and Search Division which includes the Police Dog Unit. It deals mainly with the staffing of operational matters which include the formulation and dissemination of relevant Force orders, boundary security, deployment of resources, and liaison with the Hong Kong garrison. The Regional Command and Control Centre in Operations Division provides the means for exercising control over resources both at regional and district levels. It also acts as an information centre for the passage of information to the Headquarters CCC and other agencies. Equipped with the Enhanced Computer Assisted Command and Control System, each Centre receives 999 calls from the public and provides a fast and efficient service to operational officers. The Emergency Unit within the Operations Division is primarily tasked with providing quick responses to emergency situations such as 999 calls, as well as a speedy and additional presence of uniformed police on the ground to combat crime. An EU comprises a headquarters element and four platoons which operate on a three-shift basis. The Police Tactical Unit provides an immediate manpower reserve for use in a large-scale emergency. Unit companies are attached to all land Regions and are available for internal security, crowd control, anti-crime operations, disaster response and riot control throughout Hong Kong. The PTU also includes the Special Duties Unit (SDU) which specializes in counter-terrorism and hostage rescue. Explosive Ordnance Disposal Bureau is a special standalone unit within the Operations and Support Wing. Its main responsibilities are bomb-disposal work both on land and underwater. It also trains officers on explosives-related matters and inspects storage of ammunition and explosives. Other peripheral section included the Anti-Illegal Immigration Control Centre that is responsible for collecting intelligence and monitoring operations regarding illegal immigrants from Mainland China and Vietnam. Administration Formation implements policies laid down by the Regional Commander and is responsible for the Region's general administration. Its responsibilities include community relations, staff relations, and magistrates. Crime Formation is responsible for investigates serious and inter-district crimes. In addition, it collects, collates and evaluates intelligence on criminals and criminal activity within the Region. The Traffic Branch Headquarters covers traffic control, enforcement of traffic legislation and regulations, investigation of traffic accidents, promotion of road safety, and implementing Force and Regional traffic policies. Each of the land regions holds its own Support Wing. A Support Wing oversees the execution and staffing of operational support matters, including the formulation of operational policies for both the regular and Hong Kong Auxiliary Police Force and for updating kits and equipment. It is also responsible for the various licensing functions of the Force. The co-ordination of all public relations activities is arranged through the Police Public Relations Branch. A support wing consists of Traffic Branch, Support Branch, and Police Public Relations Branch. Traffic Branch Headquarters is responsible for formulating force priorities, policies and procedures on matters related to traffic, coordinating their implementation and monitoring their effects. It processes all traffic prosecutions such as the processing of traffic summons and fixed penalty tickets. It also collects and maintains traffic-related data such as monitoring the changes in traffic legislation. The Traffic Headquarters offers advice on traffic management matters, examines local traffic patterns and new major infrastructure projects. It also formulates, monitors, coordinates and evaluates road safety efforts, enforcement programmes and traffic management schemes. It is also responsible for the administration of the Traffic Warden Corps, who assist the Police in the control of traffic and enforcement of parking offences. It comprises the Traffic Management Bureau, Central Traffic Prosecutions Bureau, and Administration Bureau. Support Branch is sub-divided into five divisions. Field Division is responsible for coordinating policy matters relating to firearms, equipment, uniforms and operational procedures. Projects undertaken by the Division during the year included the force-wide introduction of the OC Foam and the new, expandable baton. It had also been instrumental in developing technological solutions to a number of policing problems and is currently conducting a review of police uniforms including the cap and the shoes as well as other accoutrements. General Division handles policy matters relating to station procedures; the security and management of the Police Headquarters (PHQ) complex; and diverse other duties. During the year, the Division played a major role in the streamlining of station procedures; making arrangements for the reallocation of offices and facilities; formulating a new policy for parking at the PHQ as required by the PHQ Redevelopment Project and such other duties as coordinating the Force involvement in the District Council elections. Transport Division is responsible for the management and deployment of the Force fleet of approximately 2,400 vehicles, driver establishment and the acquisition of new police vehicles. It also administers all policy matters relating to police transport requirements. Force Data and Access to Information Coordination Unit is responsible for coordinating the Force response to devising internal policy on and ensuring compliance with the provisions of the Personal Data (Privacy) Ordinance and the Code on Access to Information. Police Licensing Office acts as the licensing authority for a number of licences and permits. Crime & Security Department is responsible for the force policy regarding the investigation of crimes and matters of a security nature. Crime Wing consists of a number of operational bureaux and specialized units. The operational bureaux deal with specific areas of criminal activity whereas the specialized units provide support services to operational units in the force and deal with policy matters on various issues including child abuse, domestic violence, and witness protection. Security Wing provides VIP protection and security co-ordination, including counter-terrorism. Organised Crime and Triad Bureau (OCTB or O記) investigate major organised and serious crime involving all types of activities such as theft/smuggling of vehicles, human trafficking, firearms, vice, debt collection, syndicated gambling and extortion. It also investigates triad societies and their hierarchies with particular emphasis on their involvement in organized crime. Criminal Intelligence Bureau (CIB) is the Force's central co-ordinating body for intelligence on crime and criminality which, after analysis and assessment, is disseminated to crime investigation units as required. In addition, the CIB works closely with the OCTB and other Crime Wing bureaux in tackling triad and organised crime syndicates. To strengthen the criminal intelligence capability within the Force, the Bureau also organises related training courses and seminars for investigators. Criminal Investigation Division or CID are sub-division located in each district. Commercial Crime Bureau (CCB) investigates serious commercial and business fraud, computer-related crimes, the forgery of monetary instruments, identity documents and payment cards, and the counterfeiting of currency and coins. It liaises very closely with international law enforcement agencies on exchange of intelligence and requests for investigation from other jurisdictions alleging criminal conduct in relation to commercial transactions. Narcotics Bureau (NB) investigates serious drug cases such as importation and manufacture of illicit drugs and gathers intelligence in relation to major drug activities. It also conducts investigations in partnership with overseas law enforcement agencies whenever there is a Hong Kong connection to international drug trafficking. The Bureau is also responsible for financial investigations using powers granted under the Drug Trafficking (Recovery of Proceeds) Ordinance, Organised and Serious Crimes Ordinance and the United Nations (Anti-Terrorism Measures) Ordinance. Support Group is made up of units which provide a technical and professional service to support criminal investigation, including Criminal Records Bureau, Identification Bureau, Forensic Firearms Examination Bureau, Witness Protection Unit, and Child Protection Policy Unit. The group also fulfils a liaison responsibility for the Forensic pathology Service and the Forensic Science Division. The Security Wing (Chinese: 保安部; Cantonese Yale: Bóuōn bouh) is responsible for a range of security-related matters including VIP protection, counter-terrorism and security co-ordination. Personnel Wing is responsible for all core human resource management functions, including recruitment, promotion, conditions of service, staff relations and welfare matters. In recent years, the Personnel Wing has also asserted the near exclusive right to adjudicate disciplinary proceedings brought against Inspectors and Junior Officers. The establishment of a dedicated unit for this purpose made it easier for senior officers in the Personnel Wing to influence outcomes. Hong Kong Police College is responsible for all matters relating to training within the Hong Kong Police except internal security, Auxiliary, and Marine Police training. Training provided by the Police College includes recruit and continuation training, crime investigation training, police driver training and weapon tactics training. The information technology training, command training, local and overseas management training, some specialist courses and periodic courses on firearms and first aid are also provided by the Police College. Information Systems Wing has two branches and one bureau dealing with communications, information technology, and business services. Communications Branch designs, acquires, examines, and maintains all force communications networks and equipment including radio, video, navigational aids, speed detection radar, mobile phones, pagers, office telephones and mini firing range equipment. Information Technology Branch is responsible for the planning, development, implementation, operation and maintenance of information technology systems. It has over 10,000 terminals installed throughout Hong Kong supporting the Force in the spheres of command and control, criminal records, crime intelligence analysis, fingerprint identification, reports to Police, human and financial resources planning and management, transport management, licensing, and e-mail. Business Services Bureau coordinates the business needs of the five departments of the Force. It consists of the Business Services Division, the e-Police Division and the Major Systems Division which acts as the System "Owner" for systems used Force-wide. Service Quality Wing is responsible for spearheading initiatives to improve services provided to force customers both external and internal. The wing comprises three branches: Performance Review, Research and Inspections, and Complaints and Internal Investigations (C&II). The Wing is responsible for implementing the force strategy on 'service quality' which aims at promoting efficiency, effectiveness and economy, whilst pursuing continuous improvement. The C&II Branch which includes the Complaints Against Police Office (CAPO) oversees the investigation and successful resolution of all complaints made both externally and internally against members of the force. The work of CAPO is closely monitored by the Independent Police Complaints Council to ensure that all complaints against police officers and traffic wardens are fully and impartially investigated. The findings of CAPO are then endorsed by the IPCC subject to their queries which is not rare after the enactment of IPCC Ordinance in 2009. Finance Wing is responsible for the financial management, stores, and internal audit of the Force. Administration Wing is responsible for civilian staff, force establishment matters, and the management of the Police Museum. Planning and Development Branch(P&D) coordinates strategic thinking and planning on options for the operational policing of Hong Kong into the foreseeable future. It is responsible for maintaining and modernizing the police estate and for running projects for the construction of new police buildings/facilities. The HKPF continues to use similar ranks and insignia to those used in British police forces. Until 1997, the St Edward's Crown was used in the insignia, when it was replaced with the Bauhinia flower crest of the Hong Kong government. Pips were modified with the Bauhinia flower in the middle replacing the insignia from the Order of the Bath. The crest of the force was modified in 1997. Police Constable (PC) (Traditional Chinese: 警員): slide with UI number. Uniform Branch: Dark navy blue jacket with the words 'Police', in English and Chinese, in reflective white tape, on the front left breast and back. Light blue shirts are worn by most officers, whilst white shirts are worn by senior officers. Dark blue cargo trousers and black caps are worn by all officers. Tactical Units: these uniforms are identical to those of the Uniform Branch officers, although berets are worn rather than caps and trousers are tucked into boots. Riot helmets are worn for riot control. Traffic branch: Reflective yellow jacket and navy blue riding trousers. In warmer weather, reflective vests with white sleeves are an alternative. From the return of HKPF, all patrol officers and inspectors had their whistle taken off. The same summer uniform and winter uniform was worn until 2005. Senior Constable, Sergeant and Station Sergeant ranks had their ranks moved to their shoulder slides. They are white or dark tunic. Sword design was based on 1897 pattern British infantry officer's sword and used for formal occasions such as parade out or Legal Opening Day. They are fitted with a black whistle on the front right pocket and insignia on the collar for commissioned officers. A Sam Browne belt is worn too. Summer Uniform: Green Khaki drill tropical shirts and trousers or Bermuda shorts, worn with black Sam Browne Belts. Females wore summer beige shirts with skirts. This uniform was worn until about 2005 when the force switched to a slightly modernized version of the Winter Uniform, to be worn all year round. The Green uniform can be seen in some of the older Hong Kong and Hollywood movies. Winter Uniform: Cornflower blue (or white, for commissioned officers) shirts with necktie, worn under a navy blue tunic and Sam Browne Belt, with navy blue uniform trousers. Tunic may be removed under warmer weather. Most police vehicles in Hong Kong are white, with a blue and red 3M retroreflective stripe around on the sides of the vehicle with wording "警 Police 察" in white, the only exception being the armoured personnel carriers specially designed for the Police Tactical Unit, which are wholly dark blue and with wording "警 Police 察" on a light blue background in white on the sides of the vehicle. Most police vehicles in Hong Kong are equipped with both red and blue emergency vehicle lighting. The vehicles which are assigned to airport duties have additional yellow emergency vehicle lighting. All police vehicles are government property and so bear licence plates starting with "AM". Since 2008, the Hong Kong Police Force have brought in the use of Battenburg markings for new police vehicles of the Traffic Branch Headquarters. In addition, these new vehicles show the Force crest on the front part of the vehicle, which the Force has not used in the design of new vehicles for the last two decades. The Hong Kong Police Force have unmarked police vehicles to catch and arrest criminals in the act; such vehicles include the discreet and high performance BMW M5 cars, among other types. Also, the Force operate unmarked police vehicles for surveillance to gather evidence of any criminal offence. In addition, for security purposes, armoured cars specially designed for the VIP Protection Unit (VIPPU) and bulletproof tactical police vehicles specially designed for the Special Duties Unit have no markings also. The Hong Kong Police Force has ordered 10 new electric scooters for their officers to help reduce pollution in central Hong Kong. Emergency Unit, Police Tactical Unit, and Traffic Police have identification markings on the back of the car (no motorcycles of Traffic Police), for example, PTUD 1/3. This means PTU D Team 1st Team 3rd car. EU is like this: EUKW 23. EU means Emergency Unit, KW means Kowloon West, and 23 means the 23rd car of the Kowloon Emergency Unit. Traffic Police cars include TKW 2. T means Traffic Police, KW means Kowloon West, and 2 means the second car of the Kowloon West Traffic Unit. Until 2007, EU, PTU, and TP vehicles have identification markings like this (1/3 PTUD, 23 EUKW, 2 TKW). Flashlight Used by all units as light options. Handcuffs British made models, used by all units as restrains. Sabre Red Pepper Spray Mk. 3 and Mk. 9 models, used by all units as less than lethal options. Expandable Baton 18-inch models by Phoenix and 21-inch models by ASP Inc., used by all units as less than lethal options. Speedloader Used by officers armed with revolvers. 12 rounds of ammunition are issued. Spare magazine Used by officers armed with semi-automatic pistols. Various number of rounds are issued based on the unit. Mark 3 Knife Used by SDU and CTRU. First Aid Kit Used by all units as first aid options. Cell Phone Used by all units as communication options. William Caine: the head of pre-Hong Kong Police Force from 1841 to 1844. Lee Rock: A Chief Inspector from 1949 to 1974, who was a notable corrupt officer who got tens of millions during his time at the Force. Nick Cheung: a Hong Kong actor and director. He was a former Royal Hong Kong Police officer. A movie was made about him in 1989 about his youth at the Royal Hong Kong Police Cadet School. Li Kwan-ha: the first ethnic Chinese to serve as the Commissioner of Police in Hong Kong from 1989 to 1994. Eddie Hui: the last Commissioner of the Royal Hong Kong Police from 1994–1997, and the first Commissioner of Hong Kong Police from 1 July 1997 to 1 January 2001. Stephen Lo: the current Commissioner of Police of the Hong Kong Police. Joe Ma: a Hong Kong TVB actor. He was a member of the elite VIP Protection Unit(G4) before he joined the Hong Kong entertainment industry in 1993. Hong Kong police officers stop and check a vehicle. Hong Kong faced an economic slump after the end of the Second World War in 1945. Trade was slow, mainland China was experiencing a civil war and thousands of Chinese refugees flooded the British colony to escape the Chinese communist revolution. Police management was under resourced being reliant on its staff sergeants (senior non-commissioned officers), who wielded significant power and influence within their districts, ruling their subordinates with an iron fist. It was then that corruption started to tarnish the reputation of the Hong Kong Police. Officers were reputedly poorly paid in comparison with other civil servants and with others in society in general. Some officers accepted bribes to turn a blind eye towards syndicated vice, drugs and illegal gambling activities. During the 1950s and 1960s, syndicated criminals paid regular sums of money to the staff sergeants who, in turn, used couriers and book keepers to share their ill-gotten gains amongst the officers and constables of their respective police districts. This became an increasing concern for the colonial government but corruption was overshadowed by the leftist violence and riots that beset Hong Kong in 1967, threatening the stability and very existence of the British colony. In 1969, Her Majesty, Queen Elizabeth II honoured the Force with the 'Royal' title to recognize its loyalty, dedication and efforts to restore law and order during the 1967 disturbances and Princess Alexandra became its Commandant General. The Force thus changed its name to the Royal Hong Kong Police. Although not confined to the police but tarnishing other government departments and the wider business community as well, police corruption re-emerged as a major concern in the early 1970s. The Commissioner of Police, Charles Sutcliffe, ordered investigations to break the culture of corruption and this caused forty-odd Chinese officers to flee Hong Kong with more than HK$80 million cash (about HK$2 million each). Moreover, in 1973, a highly decorated officer, Chief Superintendent Peter Godber, became embroiled in a corruption scandal when Sutcliffe found him to have amassed HK$4.3 million in assets. Godber fled the colony after learning of his intended arrest, prompting a public outcry. These events precipitated formation of the Independent Commission Against Corruption (ICAC) in 1974, which the government gave wide-ranging powers to investigate and bring to justice corrupt elements in Hong Kong society. After Godber's extradition from the UK and subsequent trial and conviction in Hong Kong, the ICAC focused its efforts on the police. Investigators mounted a series of raids on police stations throughout the colony, sometimes bringing lorry loads of officers to ICAC offices for questioning. Police discontent with this situation peaked in 1977 and the government offered an amnesty to all serving officers after junior police officers demonstrated at the Police Headquarters in Wanchai and the ICAC offices near Admiralty. Following the amnesty, the police force re-organised itself, introducing new layers of management, police procedures and supervisory accountability to deter and detect corrupt elements within its ranks. The government also greatly improved police remuneration and overhauled the terms and conditions of their service—arguably removing the incentive for corruption. Resulting from the reforms of 1979 and the early 1980s, the Royal Hong Kong Police regained its good name and reputation, becoming known as Asia's Finest. It developed a strong track record for fighting crime, and enjoyed the reputation of being one of the most professional, efficient, honest and impartial police forces in the Asia Pacific region. The force enjoyed the esteem and confidence of the public it served, as demonstrated by the University of Hong Kong opinion polls between 1997 and 2007. Its popularity peaked in 2007 with a net approval rating of 79 percentage points. Although the media has often dubbed it "Asia's Finest", its reputation has taken a serious drubbing under the leadership of the hawkish Andy Tsang, Commissioner between 2011 and 2015. As a result of Tsang's unpopular decisions and comments, the public nicknamed him "Andy the Vulture". Approval rating of the police declined markedly from mid-2012, and it plummeted to net approval of 21 percentage points in early 2015. According to a leader in the Wall Street Journal, Tsang is responsible for the politicisation of the police during his tenure, and aligning policing objectives with the state rather than in the interests of justice. The manner in which police officers have appeared to condone or turn a blind eye to assaults against certain groups, particularly heavy-handed treatment of protesters during the "Umbrella Revolution", notably procedural escalation of police violence in the face of protesters, through deployment of riot police and 87 instances in which tear gas was released to disperse unarmed students, has also caused disquiet among the public and senior police staffers alike. During Tsang's tenure, reports of alleged police harassment of protesters increased but only because the police were thrust into maintaining public order during the pro-democracy protests of the Umbrella Movement of 2014 ; Accordingly, some interest groups have claimed that the police has turned into a political tool in support of a governance system that is overseeing (wittingly or not) an erosion of the rule of law in favour of "rule by law". Fung Wai-wah, president of the Professional Teachers' Union, commented that "the police [during the Umbrella Revolution] have made themselves enemy of the people", literally overnight. Since 2014, there have been reports of police officers involved in sexual assaults on female victims. In one high-profile case involving an officer with six years' service molesting a female within Police Headquarters toilet, the officer was convicted of indecent assault and abuse of power. There had been an incident in 2008, when a woman was raped inside Mong Kok police station by a policeman. Police were criticised for violent attacked protesters in October 2014, as well as for allegedly colluding with triads and thugs against peaceful protesters. Seven police officers were suspended after a video tape surfaced of them beating a handcuffed protester in police custody on 15 October 2014, sparking outrage and accusations of police brutality. The seven officers were convicted and sentenced to two years in prison in early 2017. The police commissioner, pro-Beijing politicians, and thousands of members of the police unions steadfastly publicly supported and rallied around the convicted criminal officers. In December 2014, public satisfaction with the police had declined to 56% (from 62.3% five months earlier); its net satisfaction rate plunged to a record low of 29%, the lowest level since 1997 and lower than that of the PLA Hong Kong Garrison. Pollsters drew the conclusion that the sharp decline was due to policing actions during the 2014 protests, and said that to repair its reputation, the police would need to "strengthen its professionalism in executing its duties, and also its affection and care for the society. It should not lean towards any political force, nor resort to improper means, just let political problems be resolved in political ways". The Hong Kong Police came under fire for failing to charge police superintendent Franklin Chu King-wai, now retired, who was filmed hitting civilians with a police baton when uniformed officers were directing a line of passers-by to move along after a protest in Mong Kok on 26 November 2014. The day before Chu was due to retire in July 2015, the Independent Police Complaints Council (IPCC) established by a majority decision that a complaint against Chu was justified. The internal Complaints Against Police Office (CAPO) disagreed and sought legal advice from the Department of Justice. Despite the seemingly incontrovertible evidence against Chu, the case remains pending without a prosecution in sight, raising concerns about the partiality of CAPO and the police force as a whole. In December 2014, the police caused concern when they applied for Care and Protection Orders (CPO) for two youths, one of whom was arrested during the protests. Police arrested one 14-year-old male for contempt of court during the clearance of Mong Kok and applied for a CPO. The CPO was cancelled four weeks later when the Department of Justice decided that they would not prosecute. In a second case, a 14-year-old female who drew a chalk flower onto the Lennon Wall on 23 December 2014 was arrested on suspicion of criminal damage, but was not charged. A magistrate decided in favour of a CPO pursuant to a police application, deeming it "safer". The incident created uproar as she was taken away from her hearing-impaired father, and was unable to go to school. On 19 January, another magistrate rescinded the protection order for "Chalk Girl" after reviewing a report from a social worker. The handling of the situation by the police raised concerns, as there was no explanation as to why the police failed to locate and consult a social worker before applying for the order in accordance with proper procedures. Use of the device against minors involved in the Umbrella movement was seen as "white terror" to deter young people from protesting. In April 2015, police reputation suffered a further blow when a student accused by a police officer of attacking him during the clearance of the Mong Kok occupation on 28 November 2014 was acquitted. In three written statements and during questioning at the witness stand, Constable Lau Kam-wing accused the defendant of approaching him from the front and hitting him in the mouth. Video evidence submitted by an independent witness clearly showed that Lau was in a highly agitated state, and that the defendant was behind him and had not assaulted Lau. Lau changed his testimony under questioning, and again in light of the video evidence. The judge observed that the case was "highly suspicious" and that the defendant had been falsely accused; he criticised Lau's wavering testimony and reproached him for being a dishonest and thus unreliable witness. The judge ordered the incident to be referred to the police complaints department, and asked to be kept informed of the progress of the investigation. In May 2015, a man was arrested, detained from 2–4 May for in excess of 48 hours and wrongfully accused of murder. The man was autistic, and the police failure to handle such a case sparked controversy. According to the police, the suspect made a written confession of an assault that contradicted severely with statements obtained whilst interviewed with family members. A nursing home later offered the suspect an alibi, corroborated with video evidence, that the man could not have been at the alleged crime scene. Civil rights activists condemned the incident which traumatised a vulnerable individual, and criticised the police procedures including not proposing legal representation, lengthy detention, an methods for obtaining a bogus confession. The police chief expressed "regret" but refused to make an apology. Also in May 2015, police procedures for conducting identity parades attracted controversy when suspects in an assault case on television reporters were allowed to wear shower caps and face masks during an identity parade, ostensibly to cover distinctive features, leading to the police abandoning the case due to insufficient evidence. The police stance was confirmed by the new Chief Commissioner. In mid-September, media reported that the police had made material deletions from its website concerning "police history", in particular, the political cause and the identity of the groups responsible for the 1967 riots. Mention of communists and Maoists were expunged: for example, "Bombs were made in classrooms of left-wing schools and planted indiscriminately on the streets" became "Bombs were planted indiscriminately on the streets"; the fragment "waving aloft the Little Red Book and shouting slogans" disappeared, and an entire sentence criticising the hypocrisy of wealthy pro-China businessmen, the so-called "red fat cats" was deleted. The editing gave rise to criticisms that it was being sanitised, to make it appear that the British colonial government, rather than leftists, were responsible. Stephen Lo, the new Commissioner of Police, said the content change of the official website was to simplify it for easier reading; Lo denied that there were any political motives, but his denials left critics unconvinced. In October 2015 the Police Public Relations Bureau launched a Facebook page in a bid to improve its public image. The page was immediately inundated with tens of thousands of critical comments, many asking why the seven officers who beat the handcuffed protester a year earlier had not been arrested. In response, the police held a press conference and warned of "criminal consequences" for online behaviour. A police sergeant at the Wan Chai Police Station allegedly absconded on 1 May 2016 with HK$1.07 million (US$140,000) in bail funds. A man remanded on bail who reported to the station on 25 May claimed that an officer told him that the police could not be held liable for the missing money, and made him sign a waiver of claims in relation to the bail money he had posted previously. Although police public relations quickly apologised for the "misunderstanding" that had occurred at the Wan Chai station, media criticised top management for being equivocal and evasive about the accountability of the station and also about whether the police officers responsible for the waiver response would be disciplined. The Hong Kong Police Force and its previous incarnation have been the subject of many films and television shows, including the locally produced Police Story film series, The Criminal Investigator, Infernal Affairs film series, Cold War, and OCTB. English language films featuring the HKPF include Rush Hour. The Hong Kong Police Force and SDU have also appeared in popular video game series “Tom Clancy's Rainbow Six Siege”, and "Sleeping Dogs", among others. ^ Carroll, John M. (2007). A Concise History of Hong Kong. Rowman & Littlefield. ISBN 0-7425-3422-7. ^ "Organisation" (PDF). Hong Kong Police Force. ^ "History". Hong Kong Police Force. Archived from the original on 2 April 2009. ^ "Police fired at least 3 teargas canisters". Apple Daily (in Chinese). Retrieved 29 September 2014. ^ "Police fire tear gas and baton charge thousands of Occupy Central protesters". South China Morning Post. 29 September 2014. Retrieved 29 September 2014. ^ "'B' Department (Crime & Security)." (Archive) Hong Kong Police Force. Retrieved 11 July 2013. ^ "Organization Structure: Organization Chart of HKPF". Hong Kong Police Force. ^ "Boys in blue go green". Boys in blue go green. CNN. 27 November 2011. Retrieved 29 November 2011. ^ “The Modern Era 1945-1967”, PDF file, Hong Kong Police Force (http://www.police.gov.hk/info/doc/history/chapter02_en.pdf : retrieved 10 March 2017). ^ Wiltshire, Trea (1997). Old Hong Kong. Volume II: 1901–1945 (5th ed.). FormAsia Books. p. 148. ISBN 962-7283-13-4. ^ a b c d “Creating a Legend 1967-1994”, PDF file, Hong Kong Police Force (http://www.police.gov.hk/info/doc/history/chapter03_en.pdf : retrieved 10 March 2017). ^ “Police chief who tore the mask of corruption from force”, South China Morning Post (http://www.scmp.com/article/517892/police-chief-who-tore-mask-corruption-force : 27 September 2015). ^ “About ICAC: Brief History”, Hong Kong Independent Commission Against Corruption (http://www.icac.org.hk/en/about/history/index.html : retrieved 15 March 2017). ^ Stephen Vines (14 November 1997). "Hong Kong: A corrupt police force haunted by its criminal record". The Independent. ^ “Creating a Legend 1967-1994”, PDF file, Hong Kong Police Force (http://www.police.gov.hk/info/doc/history/chapter03_en.pdf : retrieved 10 March 2017). ^ a b c d Te-Ping Chen; Lorraine Luk; Prudence Ho (4 October 2014). "Hong Kong Police's Use of Tear Gas During Protests Hurts Reputation of 'Asia's Finest'". The Wall Street Journal. ^ a b "Hong Kong police charge leaves protesters injured". Business Insider. 18 October 2014. ^ a b "熱血時報 – 市民對警隊滿意率紀律部隊中最低". Passion Times. ^ a b c "The Decline of Hong Kong's Police". The Wall Street Journal. 7 May 2015. ^ David Tweed (2 October 2014). "Tear Gas Erodes Hong Kong Police Force's Hard-Won Reputation". Bloomberg L.P.
^ "Hong Kong police's harassment of protesters tarnishes good name of Asia's Finest, South China Morning Post. ^ a b "Hong Kong: Massive anti-government protests after attempted police crackdown". chinaworker.info. 1 October 2014. ^ a b Dapiran, Antony (15 Dec 2014). "Mixed legacy for Hong Kong's Umbrella Movement", Business Spectator. ^ "Hong Kong police to remove protesters from streets after court order". Los Angeles Times. 9 December 2014. ^ "CID涉警總摸女醫生胸　搜身看私處兩秒 遭加控公職人員行為失當". Apple Daily (in Chinese). 10 April 2015. ^ "警員警總內非禮女疑犯罪成　裁判官面紅耳赤狠批濫用公權力". Ming Pao. 6 November 2015. ^ "Police investigator in dock for indecent assault". EJ Insight. 16 January 2015. ^ Browne, Andrew; Chen, Te-Ping; Steger, Isabella (4 October 2014). "Clashes Break Out at Hong Kong Protest Site". The Wall Street Journal. ^ "Hong Kong clashes continue in Mong Kok". CNN. 3 October 2014. Retrieved 3 October 2014. ^ "US calls for swift probe into Hong Kong police brutality". EJ Insight. 17 October 2014. ^ Hong Kong police arrest 7 officers for beating protester, Associated Press, USA Today. 27 November 2014. ^ Wright, DS (15 October 2014). "Hong Kong Police Officers Suspended After Video of Beating Occupy Central Protester Goes Viral". firedoglake.com. ^ "Hong Kong Police Officers Suspended After Allegedly Beating Pro-Democracy Protester". The Huffington Post. 15 October 2014. ^ "LIVE: Over 30,000 police union members rally around 7 officers who assaulted pro-democracy activist". Hong Kong Free Press. 22 February 2017. ^ "'Asia's Finest' take poll fall" Archived 26 February 2015 at the Wayback Machine. The Standard, 10 December 2014. ^ a b c "See how decadent police and pro-establishment camp have become". EJ Insight. 31 May 2016. ^ "Police believed to have begun criminal probe on Franklin Chu". EJ Insight. 22 February 2016. ^ a b c d Lau, Chris. "Police won't seek protection order for Hong Kong teen arrested during Occupy clearance". South China Morning Post. ^ Khan, Natasha (18 December 2014). "Schoolboy May Lose Parents as Repercussions Dawn in Hong Kong". Bloomberg L.P. Retrieved 18 December 2014. ^ "Girl, 14 who drew flower on Hong Kong's 'Lennon Wall' sent to Children's Home". Agence France-Presse. 31 December 2014. Retrieved 31 December 2014. ^ "Teen arrested for drawing with chalk on wall at Hong Kong protest site". CNN. 31 December 2014. Retrieved 12 January 2015. ^ Chu, Julie (1 January 2015). "Girl sent to children's home for drawing flowers on Occupy's 'Lennon Wall' freed after outcry". South China Morning Post. Retrieved 1 January 2015. ^ "Hong Kong protest 'graffiti teen' allowed to stay with family". Channel NewsAsia. Archived from the original on 2 April 2015. ^ Chu, Julie (19 January 2015). "Chalk Girl who drew on Occupy 'Lennon Wall' released as court refuses to put her in children's home". South China Morning Post. Retrieved 19 January 2015. ^ a b "學生涉襲警脫罪 官斥警口供不實 轉介投訴課". TOPick 話題. 2 April 2015. ^ a b "Video casts doubt on cop's claim student hit him during protest". EJ Insight. 27 March 2015. ^ "學生被控旺角襲警罪名不成立". i-cable.com. 2 April 2015. ^ a b Ngo, Jennifer (15 May 2015). "Autistic man wrongly arrested by police over murder could suffer long-term effects, say experts". South China Morning Post. ^ a b c "警員行使權力前 請想想「良心究竟是什麼」". 立場新聞 Stand News. ^ "New Hong Kong police chief says suspects have rights as he is drawn into row over identity parade". South China Morning Post. 4 May 2015. ^ "Suspects in reporters' assault wore masks, caps in police lineup". EJ Insight. 4 May 2015. ^ "Police rewrite history of 1967 Red Guard riots". Hong Kong Free Press. 14 September 2015. ^ a b "Why are the police tampering with 1967 riots history?". EJ Insight. ^ "Police chief defends editing of '1967 riots' history on website". EJ Insight. 16 September 2015. ^ Zeng, Vivienne (6 October 2015). "Police warn of 'criminal consequences' after Facebook page is flooded with abuse". Hong Kong Free Press. ^ "Police accused of forcing man into waiver after bail money theft". EJ Insight. 27 May 2016. ^ "German, Israeli consulates issue statements criticising Hong Kong police Holocaust comparison - Hong Kong Free Press HKFP". 24 February 2017. ^ "Don't compare police troubles with persecuted Jews, Israeli consulate urges". This article incorporates text from a publication now in the public domain: Hong Kong – The Facts, published by the Information Services Department, Hong Kong Special Administrative Region Government. Wikimedia Commons has media related to Hong Kong Police Force. Deflem, Mathieu, Richard Featherstone, Yunqing Li, and Suzanne Sutphin. 2008. “Policing the Pearl: Historical Transformations of Law Enforcement in Hong Kong.” International Journal of Police Science and Management 10(3):349-356.